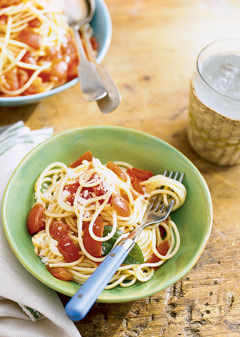 Combine all ingredients except pasta in a glass bowl and cover and let rest for 1-2 hours. There is no need to refrigerate. Boil water, add salt and prepare pasta to directions. Once done, drain and combine with sauce, add salt to taste and finish with a little additional Extra Virgin Olive Oil and Parmesan cheese. Serve immediately.